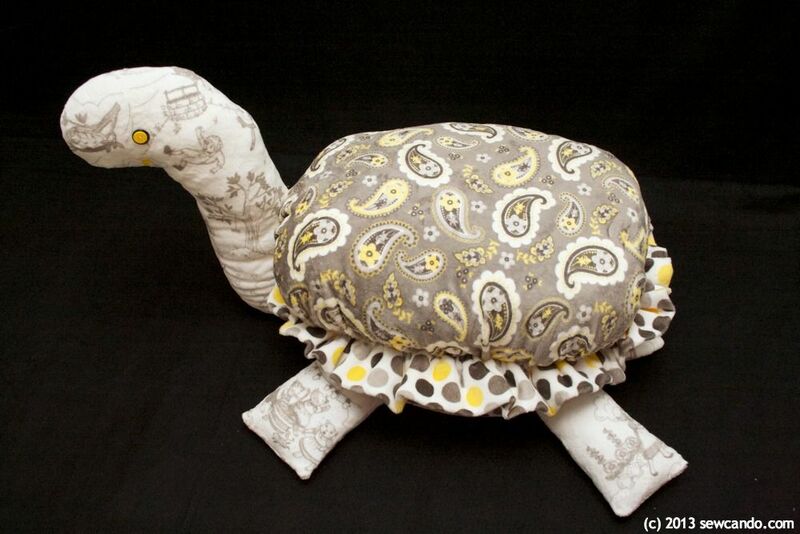 Sew Can Do: Cuddle Turtle Footstool & Shannon Fabrics Cuddle Fabric Giveaway! 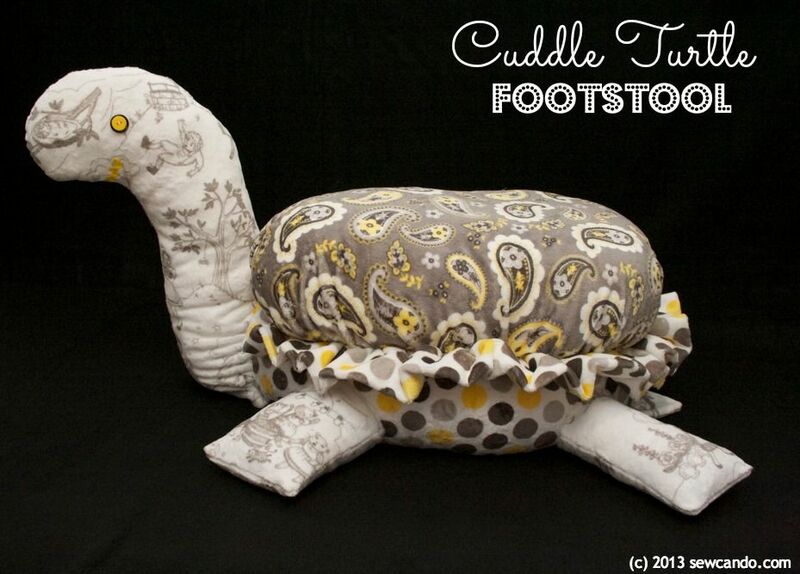 Cuddle Turtle Footstool & Shannon Fabrics Cuddle Fabric Giveaway! My plan was to redo her in some fabric that would look really nice, but also be hard wearing & kid-friendly. The answer was Shannon Fabrics Cuddle™ Fabric. 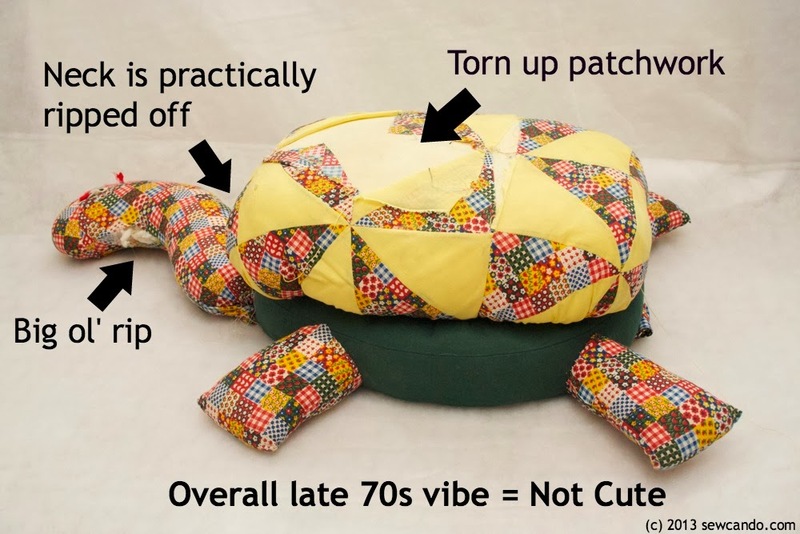 I thought I'd share how I made this major transformation and give away some of this wonderful fabric, so you can make your very own turtle footstool too! - Keep a vacuum handy, since it does tend to shed when cut. - Pop cut pieces in the dryer on air dry for a few minutes helps remove any loose fluff on edges. 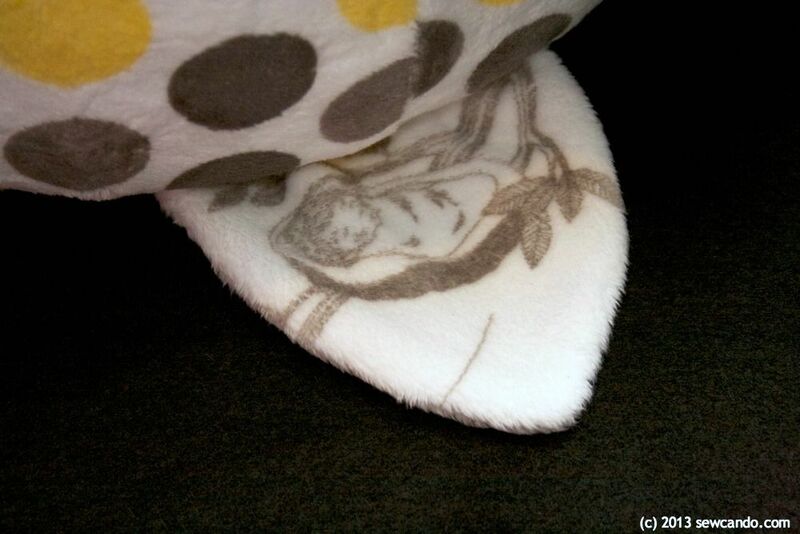 - A walking foot isn't absolutely necessary, but it will help keep Cuddle fabric (and other thick or knit fabrics) from shifting or stretching unevenly. 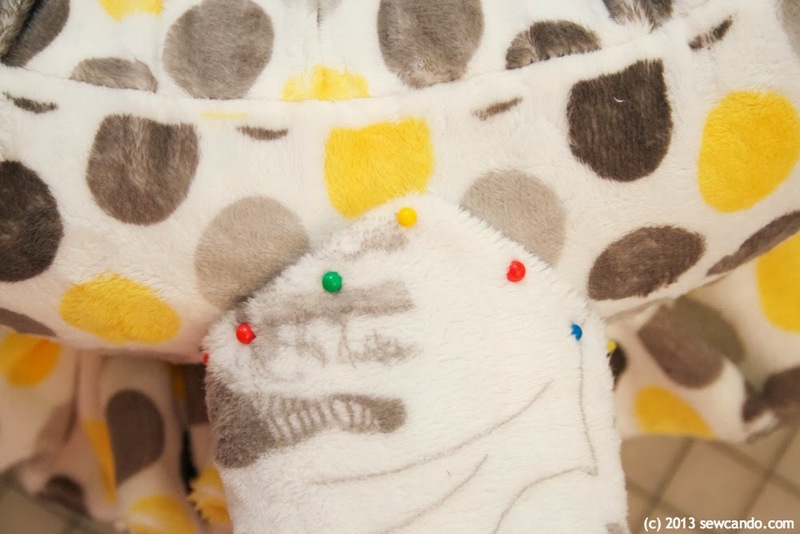 - Use a stitch length of 3, this is better suited to fabrics with a bit of stretch. 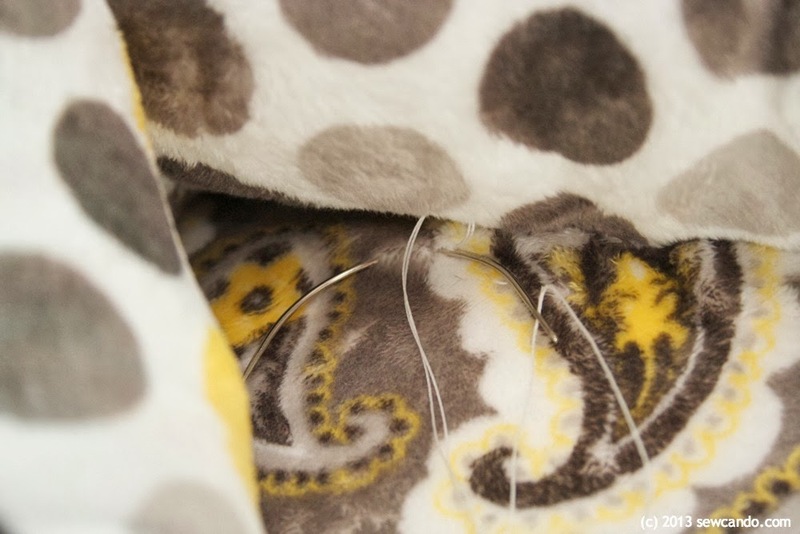 - There is a nap, so make sure it is facing the same direction when stitching pieces together. For the front legs I cut two rectangles 9 inches wide by 8.5 inches high and for the back legs I cut two rectangles 11 inches wide by 7.5 inches high from the Toile. I folded each leg widthwise, with right sides facing and stitched along the bottom and side with a 1/2 inch seam allowance, then turned right side out and stuffed. I also cut two 4.5 wide by 5.5 inch high curved pieces for the tail and stitched them together leaving a small gap on the flat end for turning. I drafted a pattern 6 inch wide by 19 inch high piece for the head/neck on paper cut out two halves and stitched them together with right sides facing, leaving the bottom open to turn and then stuffed. For the top of the shell I cut an oval 29 inches high by 26 inches wide and a smaller 16 inch wide by 13.5 inch high for the underside from the Pretty Paisley. I basted two rows 1/4 and 1/8 inch away from the edge around the top piece. I placed my original shell stuffing in the center and pulled up on the bobbin threads of the basting to fit the fabric around the interior. If making from scratch, I'd suggest cutting some foam in an oval that will be 13in wide x 16in long x 5in thick and covering it with a layer of quilting batting to make a shell inner. Then I covered it with the smaller oval, pinned in place (folding it's raw edges under) and slipstitched them together. Then it was time to do the base. From the Mod Dot print, I cut two pieces that were 12 inches wide by 24 inches high and stitched them together on one short side. Then I folded the new piece widthwise and stitched one short end and down the length and turned right side out. I stuffed the original base piece inside the new outer and stitched the open end closed. I brought the short ends together and hand stitched them together with a slipstitch using upholstery thread. To make the ruffle addition I cut three pieces 36 inches wide by 8 inches high and stitched them together on the short sides to make one long strip. Like the base, I folded this piece widthwise and stitched one short end and down the length and turned right side out. I overlapped the short ends and stitch them together to form a loop. I ran a basting stitch 1/4 inch from the seam and a second one 1/8 inch over. Because this fabric is thicker when folded, & this is a big piece to ruffle, I used elastic thread in my bobbin at this point. 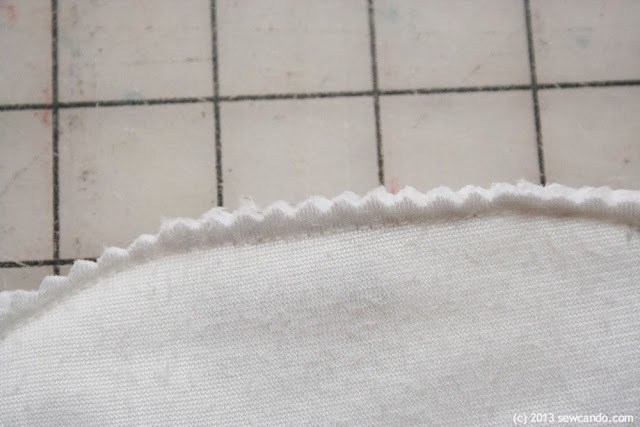 It won't break as easily as standard thread when being pulled this much and will help ruffle up the fabric. I pulled up bobbin thread and spread the ruffles evenly to fit around the base edge. Pin onto base as shown and then hand stitch together with a slipstitch. Next I added the shell on top of the newly ruffled base and flipped it all upside down. The underside of the shell was then slipstitched to the inside edge of the base. This is where the curved upholstery needle really came in handy to get into the tight curved spots. 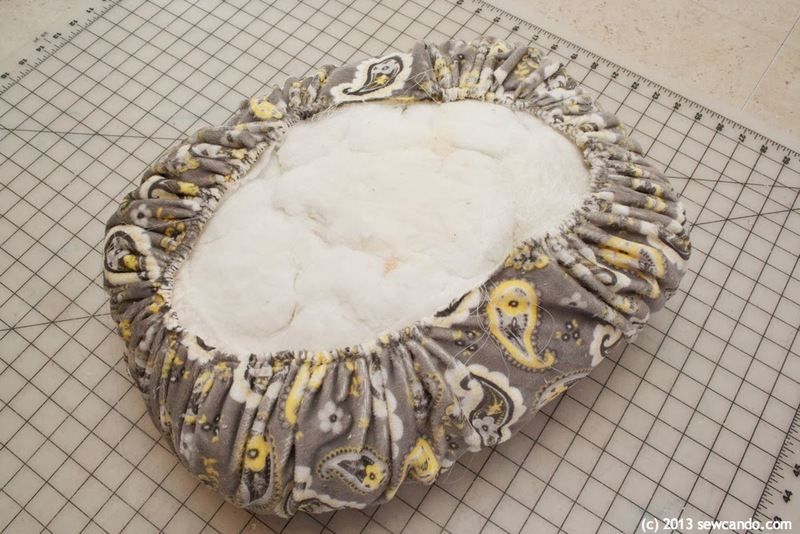 I also flipped it right side up and stitched along the outer edge of the shell, going through the ruffle into the outer edge of the base, so it can really withstand the kids playing with it. After stuffing the original legs into the new outers, I folded the raw edges inward and pinned them and the tail to the base and slipstitched together. I did the same with the neck, stitching from bottom, all the way around the shell and back down. Now how about a chance to win this very fabric for yourself? 3 yard trio Cuddle Classics Fabric! You've performed and amazing transformation on your turtle footstool. It's cozy and inviting and so cute! I'm loving the nursery rhyme themed fabric! Have a great day. Thanks so much. It's hard to believe it's the same footstool when I look at it! Nested Owls is my favorite & I'd make a quilt for my great niece who loves owls. Thanks. So many awesome choices... I am loving Crazy For Daisies! 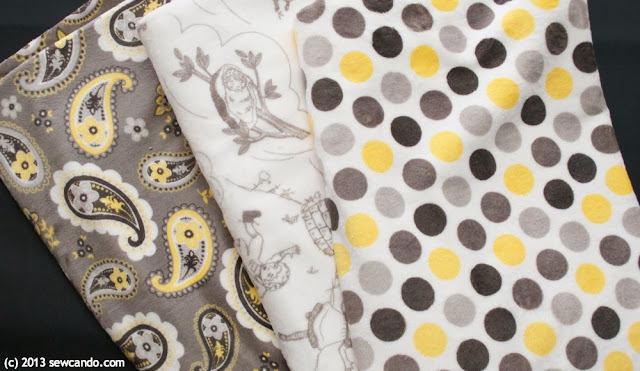 I love the Crazy for Daisies collection of cuddle fabrics. I'd make something snuggly for my granddaughters with it.Thanks. They are all so cute! But I like the gray and yellows that you used. I would probably use it for baby blankets for my nieces and nephews. I really like the RKC Night Owls Watermelon/Topaz fabric. 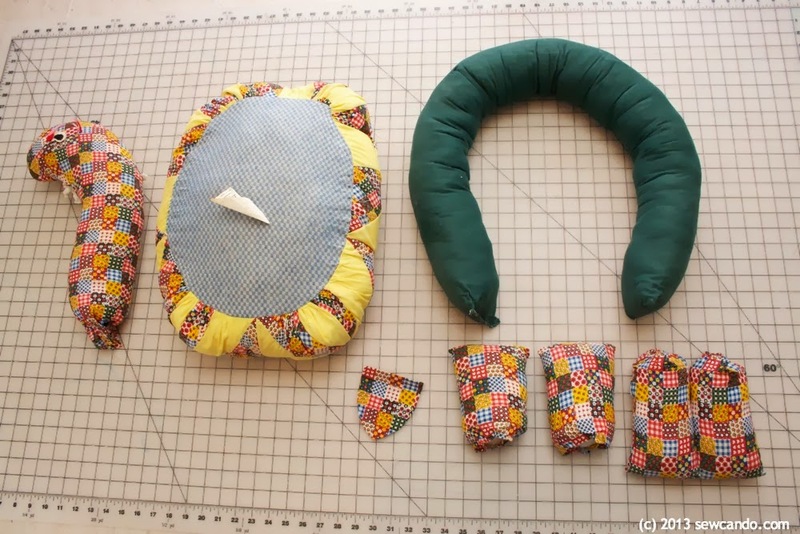 I would use it to make a blanket for my new little niece! I think the Kozy Cuddle fabric would be perfect for the back of a quilt! Too cute! I have a niece who wants a turtle for Christmas, such great timing! I know Mom and Dad don't want a pet right now. I absolutely adore you turtle foot stool....both of my grand babies would just flip over each a stool like this.. and they asked for pets for Christmas from Granny !!!!!!! Perfect is what I say !!!!!! Thanks for giveaway & pattern !!!! Aw, that is fantastic Linda. It truly makes me thrilled to hear that my tutorials are such a great fit with what people are wanting. I'd love to see yours when you make them! 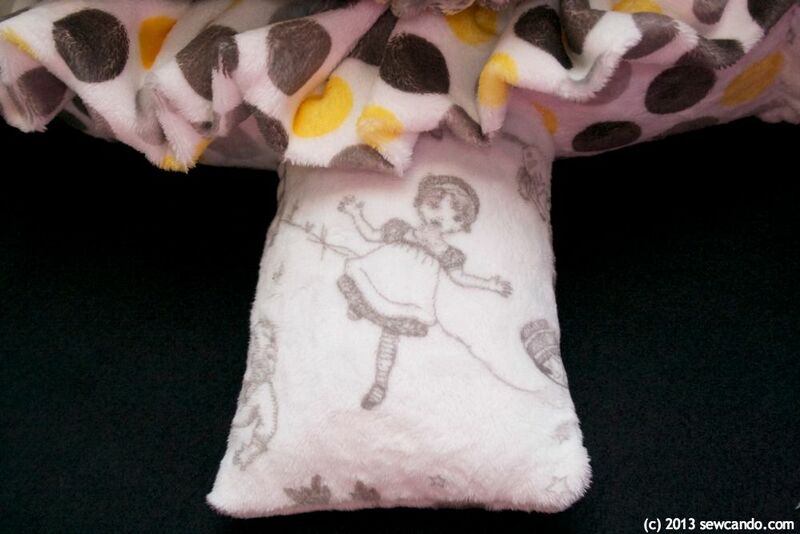 I love the pink dot cuddle fabric and I would make a blanket for my daughter. oh wauw, this will be on my to do list! I can't choose, so many great fabrics! My kids are in need of winter pj's, these would be perfect for it! Your new old turtle looks happy in her new outfit! 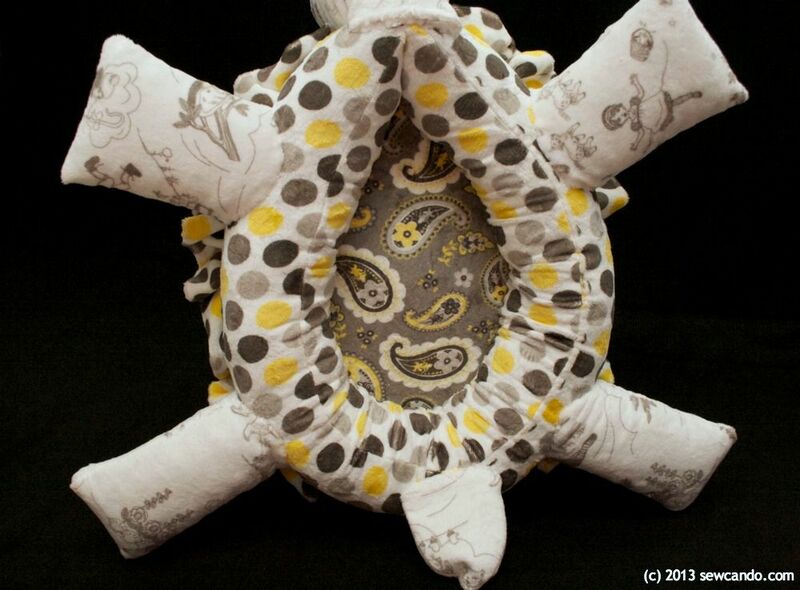 If I were to win, I'd buy a selection of fabrics from the Mar Bella Cuddle group. I love everything there! I would put the pieces together to make myself a small quilt to watch TV with. I like the fabrics in the Robert Kaufman collection,especially Night Owls. Thanks for the giveaway. I would get the soft fur collection and make this turtle. I love him and I collect turtles and have 2 live turtles. One is called Big Boy and the other is Houdini. Thank you for the tutorial and the chance to win the great giveaway. I am fairly new to quilting so am just using quilters cotton for now. Charcoal/Snow and I would make some soft pillows. It looks really nice and I am sure that my kiddos would really like it. You gave me great idea. Thank you for that! I want to make this for my 2 year old grandson. I know he would love sitting on it. My favorite fabric is Tile Cuddle Scarlet. Thank you for the chance. I like the Mar Bella Cuddle Collection. I'd make hand clutches with them! 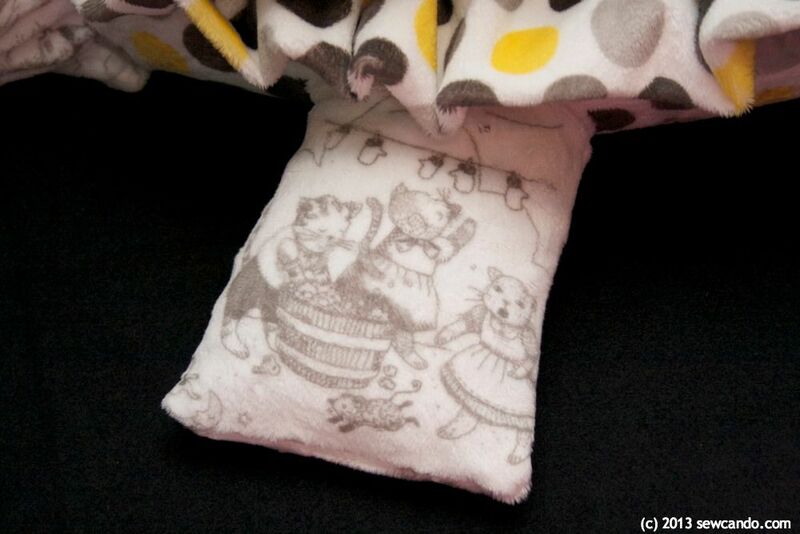 I love the cuddle print collection & would make lots of stuffed animals! Love the black and white one you've used here so precious! 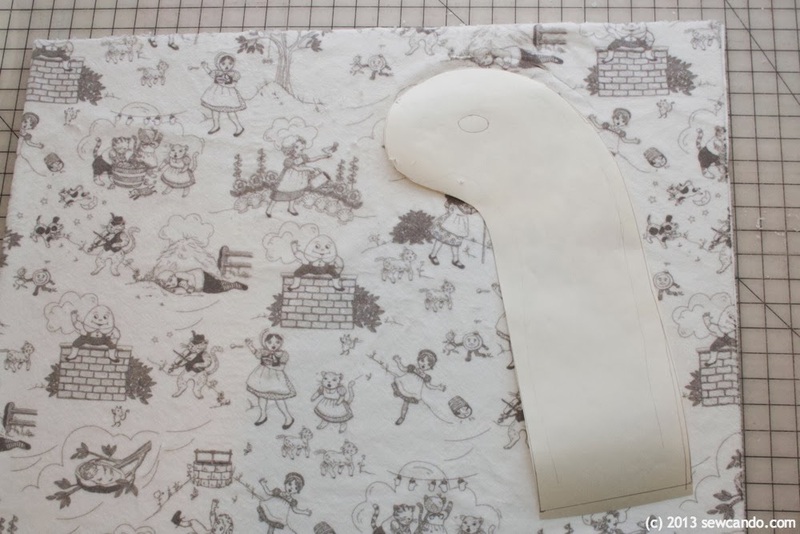 I have never made anything with Cuddle fabric but have heard how wonderful it is, so would like to make something like the turtle for her. 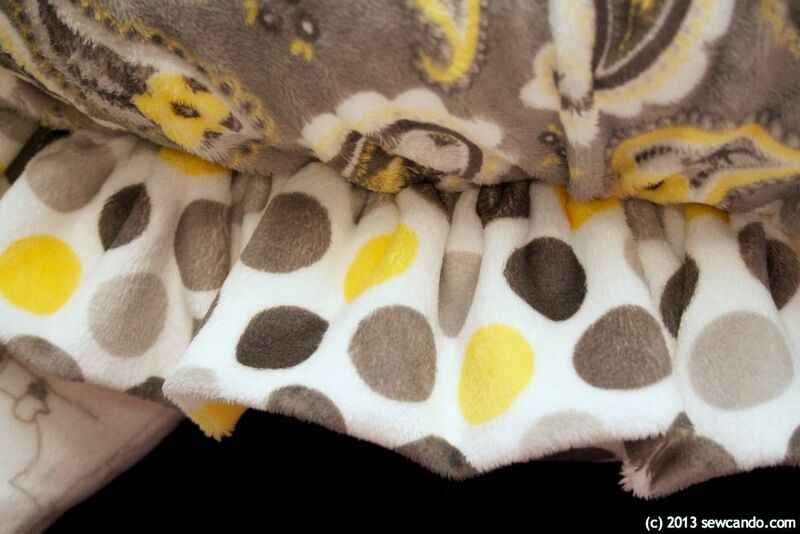 The Cozy Cuddle fabric would be perfect for my first grandchild. Something he could "cuddle" up to! ha. i want that set you're giving away! i love that it's a little more grown up and not traditional baby colors! but it is still sweet! now... if I can just find a turtle pouf to recover I'll be set! LOL! Am trying to think how to DIY this... wondering if for the base, the round part on bottom, if a pool noodle would work? thinking... maybe need to do bun feet and just a plywood disk for the base and make it like a regular ottoman... with a head and feet... LOL! 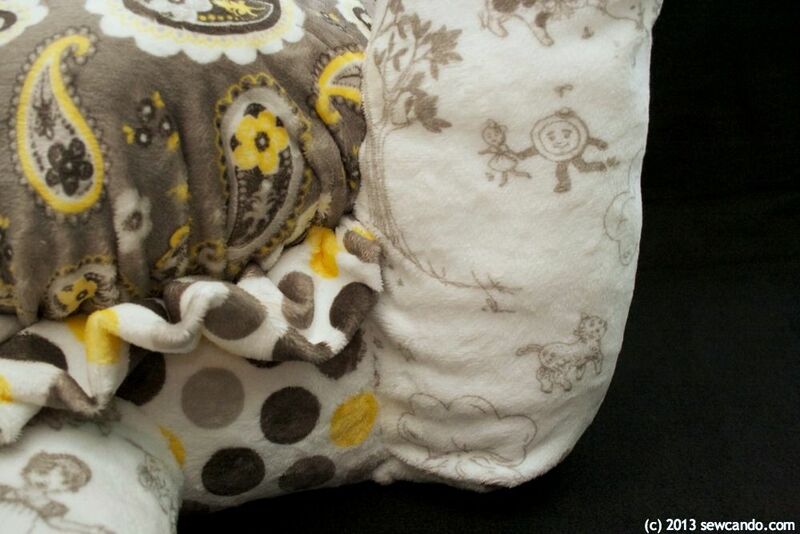 I love the Nested Owl pattern, and I'd make soft pillowcases! I like the Marble black/beige soft cuddle material, and the snowflake cuddle in red. 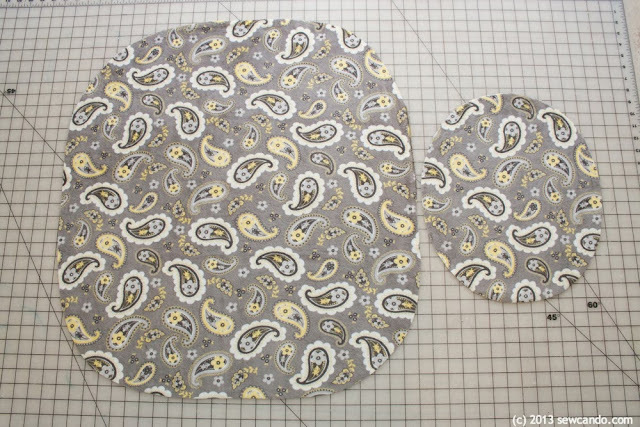 I like the nested owls collection, and would use it to make a quilt for my granddaughter. I love your turtle! Thanks so much for sharing! I like the Safari Print Faux Furs, and I would use them to make cat pajamas. Fuscha classic damask! I'd love to make a blanket with it. 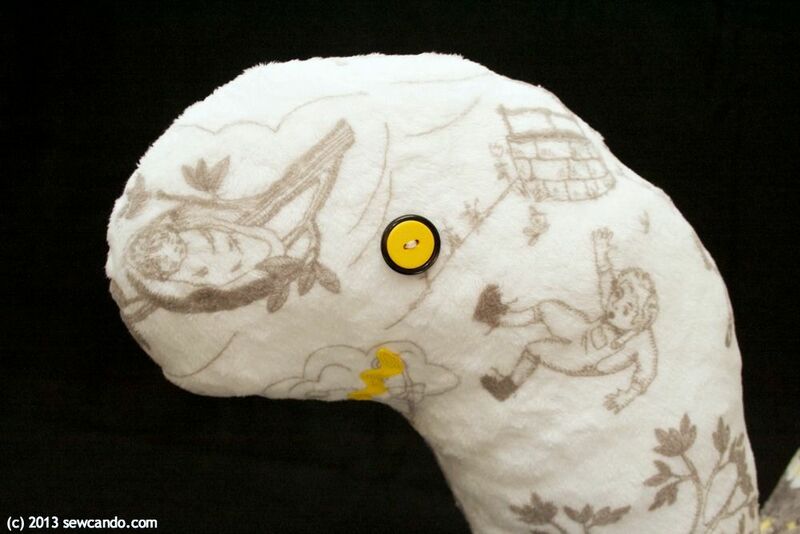 I like the Toile Cuddle collection. Had no idea that it existed in toile. Thanks so much! I'd make a comfort quilt for a friend.